In December, the Free Library announced an impactful pilot program and partnership with the Philadelphia Prison System (PPS). We are pleased to report that our focused effort to reach out to inmates, returning citizens, and their families has thus far been met with great success! The Free Library first piloted a program in 2013 to provide library services to prisoners in the Philadelphia Prison System. We created standing libraries in Curran-Fromhold Correctional Facility (CFCF), the largest city prison. During the three-month pilot, 100 inmates visited the library 360 times and had access to 600 books. The pilot was so successful, PPS approved the expansion of the FLP Prison Library Service, which currently consists of libraries at CFCF, Riverside Correctional Facility (RCF), and the Alternative and Special Detention Unit (ASDU). Trained inmates now run these libraries with minimal Free Library oversight. Building upon the success of this program, this past winter Free Library staff initiated a pilot of two services: Stories Alive, a family literacy and video chat program for current inmates, and a program to provide returning citizens with temporary library cards and a re-entry resource guide. The Free Libary received a Sparks! Ignition Grant in 2015 to pilot this program. 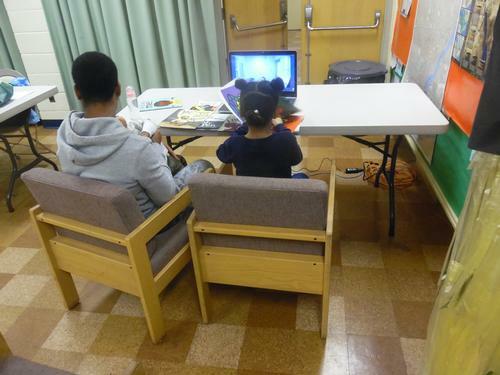 Through this pilot, the Free Library, in partnership with PPS, is offering 10 months of Saturday sessions, where inmates can read to their children via computer technology at three neighborhood libraries—Frankford Library, Kensington Library, and Widener Library. The above programs were launched in February 2016, and they have been exceedingly positive for all involved. Project staff have placed a range of books—selected with the help of a children’s librarian, with a focus on parent-child relationships and appropriate for children from birth to 12 years of age—in the prison facilities. During each session, both the incarcerated parent and child(ren) at the neighborhood libraries get the same books to read together. In addition to reading books together, parents and children practice spellings, talk about school, sing songs, and even pray together. Children leave with copies of the books they read, allowing them to reread the stories they shared with their incarcerated parents. Families also receive a copy of Bridges, the Free Library's re-entry guide for returning citizens, to help plan for their family member's return. The project staff selected Frankford, Kensington, and Widener libraries to bring the sessions as close as possible for the participating families. These libraries were selected based on the National Association for the Advancement of Colored People's (NAACP) report that highlighted prison admission based on zip codes. Stories Alive is available to incarcerated parents at CFCF and RCF, and only approved family members can participate. Both inmates and family members can request sessions. The project staff contacts interested families and schedule sessions at the most convenient location for them. The program aims to support family literacy, family bonding, and to strengthen relationships with neighborhood libraries. By hosting Stories Alive in neighborhood libraries, we hope to increase families’ and returning citizens' engagement with those same libraries and increase their participation in other library programs and services. It has proven to be a transformative program, and we are excited to see it continue.